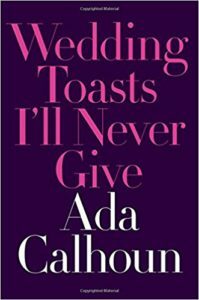 Inspired by her wildly popular New York Times essay The Wedding Toast I’ll Never Give, Ada Calhoun provides a funny (but not flip), smart (but not smug) take on the institution of marriage. Weaving intimate moments from her own married life with frank insight from experts, clergy, and friends, she upends expectations of total marital bliss to present a realistic—but ultimately optimistic—portrait of what marriage is really like. There will be fights, there will be existential angst, there may even be affairs; sometimes you’ll look at the person you love and feel nothing but rage. Despite it all, Calhoun contends, staying married is easy: just don’t get divorced. Wedding Toasts I’ll Never Give offers bracing straight talk to the newly married and honors those who have weathered the storm. This exploration of modern marriage is at once wise and entertaining, a work of unexpected candor and literary grace. This is my favorite kind of books to read: realistic and humorous essays all tied together under a common theme. I wasn’t familiar with Calhoun’s writing prior to this book but I’m a big fan now. Her voice is more nuanced and mature than glib “Dear Abby” type of advice yet she is funny and honest. She doesn’t sugarcoat relationships and marriage and with chapter titles called “Toast 5: Fighting in Rental Cars” she wears the scars of experience like a pro. However, she’s not overly biting and cynical so as to leave hope with the reader for a satisfying – yet not stress-free – relationship. Her Epilogue of “One Toast I Would Actually Give’ brought tears to my eyes as Calhoun summed up all the perfectly imperfect ways marriages work throughout the centuries. Highly recommended for anyone who has ever been or someday would like to be in a long-term relationship!